PHILADELPHIA — The Yeadon man who told police he shot a Philadelphia police officer in the name of Islam traveled to the Middle East twice since 2011, ABC news is reporting. The news outlet also reported that Edward Archer, 30, was not on any terrorist watch lists and was due to be sentenced Monday for an unrelated crime. Archer appears to have made a trip to Saudi Arabia in 2011 for Hajj, the sacred Muslim pilgrimage, and then to Egypt in 2012. Investigators are looking into whether those trips were related to Friday's shooting. Philadelphia Police Commissioner Richard Ross told reporters on Friday that Archer confessed to ambushing Officer Jesse Hartnett at about 11:30 p.m. Thursday as he sat behind the wheel of his cruiser because police enforce rules that go against the Quran. The man who ambushed an American police officer at point-blank, pledged his allegiance to Islamic State, says police commissioner. Philadelphia: A Philadelphia police officer was shot and seriously wounded in an ambush-style attack while sitting in his patrol car and the shooter admitted to committing the assault "in the name of Islam," the city's police commissioner said on Friday. Edward Archer of Philadelphia approached Officer Jesse Hartnett, 33, shortly before midnight and fired 11 rounds, three of which hit the officer in his arm, according to authorities said. Police released still images from surveillance video that showed the gunman dressed in a long white robe walking toward the car and firing, eventually getting close enough to reach in the window and shoot the officer at point-blank range. "He has confessed to committing this cowardly act in the name of Islam," Philadelphia Police Commissioner Richard Ross told reporters at a press conference, adding that the man also referenced Islamic State militants. There was no evidence as yet that the shooter had worked with anyone else, Ross said. "He was savvy enough to stop just short of implicating himself in a conspiracy," Ross said. "He doesn't appear to be a stupid individual, just an extremely violent one." Despite being shot three times in his left arm, Officer Jesse Hartnett, who managed to exit his vehicle and pursue the shooter. The 33-year-old officer returned fire, hitting Archer at least three times. Officer Hartnett, a five-year-old veteran of the force, was taken to Penn Presbyterian Hospital and will require several surgeries. Surveillance video, apparently taken from a building or post behind the incident, shows a man in a long white robe over dark pants and wielding a gun running into the street and right up the police car. He puts the gun directly into the driver-side window and fires. "Shots fired! I'm shot! I'm bleeding heavily!" Hartnett can be heard shouting on the police radio, KYW-TV reports. "We're just lucky, that's all I can say," Ross told reporters. "I can't even believe that he was able to survive this." The suspect, who had been shot in the buttocks by Officer Hartnett, was quickly taken into custody by other officers after running from the scene, according to Ross. The gunman, wearing multiple layers of clothing, flagged down Hartnett's police car on 60th street and opened fire, The Philadelphia Inquirer reported, quoting police. "This is absolutely one of the scariest things I've ever seen," Ross told reporters. "This guy tried to execute the police officer. The police officer had no idea he was coming." Ross said their was no apparent motive for the attack. "Why someone would do something so absolutely evil is just beyond us," he said. "It's amazing he's alive." According to Philly.com, quoting unidentified sources, the suspect is Edward Archer, 30, of Yeadon,a borough just outside Philadelphia. Philly.com's reporter spoke to Archer's mother, Valerie Holliday, who said her son suffered head injuries from playing football and a moped accident. She is quoted as saying that he has "been acting kind of strangely lately, talking to himself ... laughing and mumbling." Jim Kenney, who is in his first week as mayor of Philadelphia, said: "There are just too many guns on the streets and I think our national government needs to do something about that." The attack comes a month after a married couple fatally shot 14 people in San Bernardino, California, in an attack inspired by Islamic State militants. The shooter used a gun that had been stolen from a Philadelphia police officer's home several years ago, but not by the shooter, Ross said. "We know it was stolen, how many hands it may have passed through in the last couple of years, we do not know," Ross said. 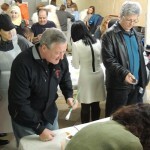 MIM:Philly's Mayor Kenney visited the radical Al Aqsa Islamic Society in Germantown to show solidarity with Muslims after the police shooting. The visit received almost no coverage in the media. Our community agrees with Mayor Kenney, that the senseless shooting of Officer Jesse Hartnett cannot be justified by any religion. We are united with our fellow Philadelphians and decry this and all senseless violence and urge that we do more to prevent the proliferation of guns on our streets. Our Mosque and community join with the rest of our City in praying for the speedy recovery of Officer Hartnett.